Bruce and I plan to transit a series of canals or, in some cases, ditches on this next trip. Some of those ditches are pretty narrow so I wanted to make sure that we would have a good chance of getting through them. 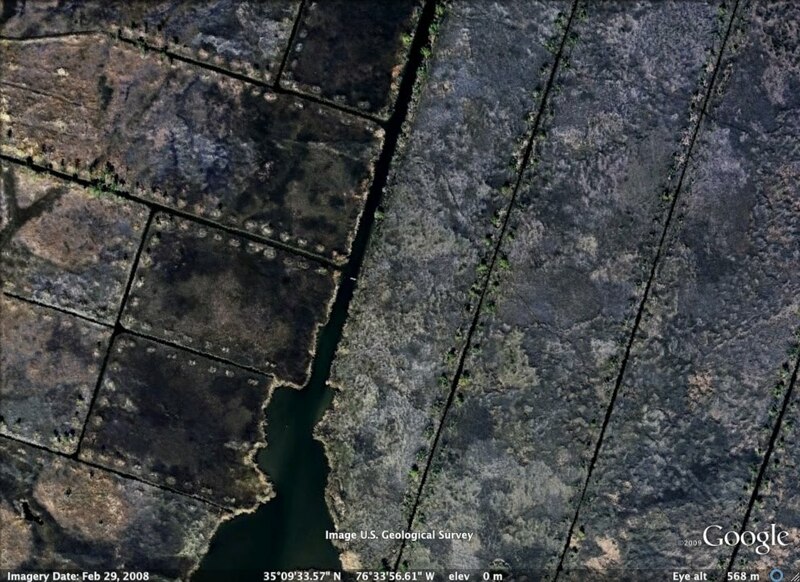 On the walkabout I went through what I think, from looking at google earth, the narrowest ditch. 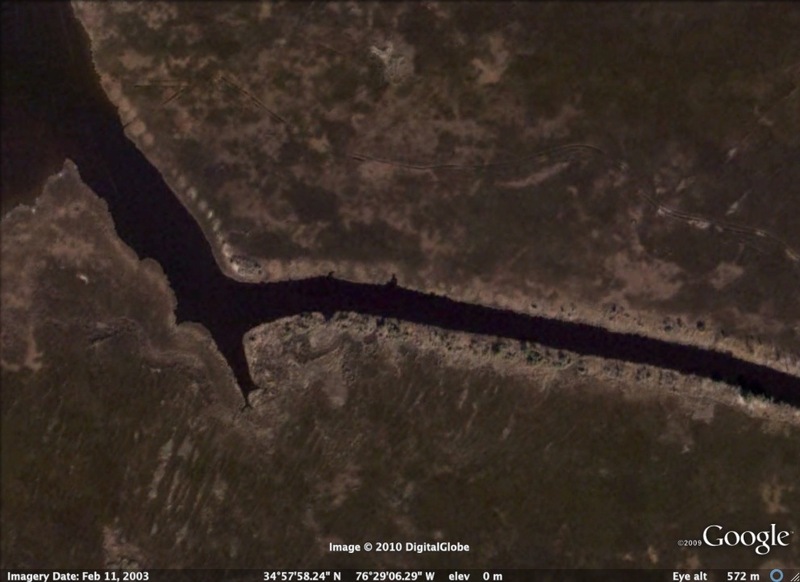 That is Dump Creek (photo above, google earth view below) that goes from Jones Bay to the Bay River. Sure, we could easily get from one to the other by going down the ICW. But we thought this might be fun and interesting. Dump Creek is both narrow and shallow. From my trip through would get it is at most 18 feet wide, maybe 15 in some places. And shallow too but there was enough depth to leave my rudder and cb partially down. 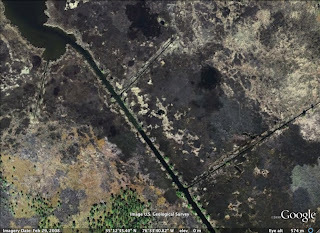 For comparison sake, below is the ICW near Hobucken. 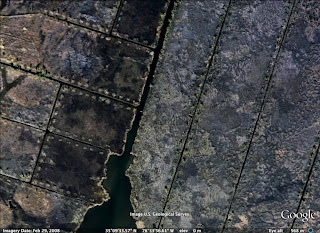 All of these images were taken from google earth at an eye altitude of rough 570 meters so these are pretty accurate side-by-side comparisons. 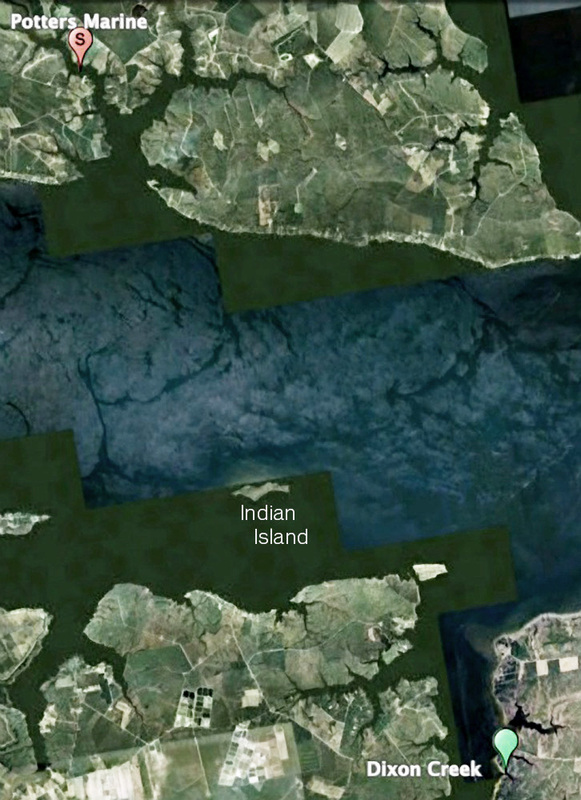 It looks like Dipping Vat Creek, below, connecting Bonner Bay to the Neuse River, is slightly wider than Dump Creek. We should be able to handle that. That fact that the ditches are man-made and virtually straight makes things a little simpler. From one entrance you can typically look straight down the canal to the other end. It is pretty easy to see if the path is clear and wide enough to transit. 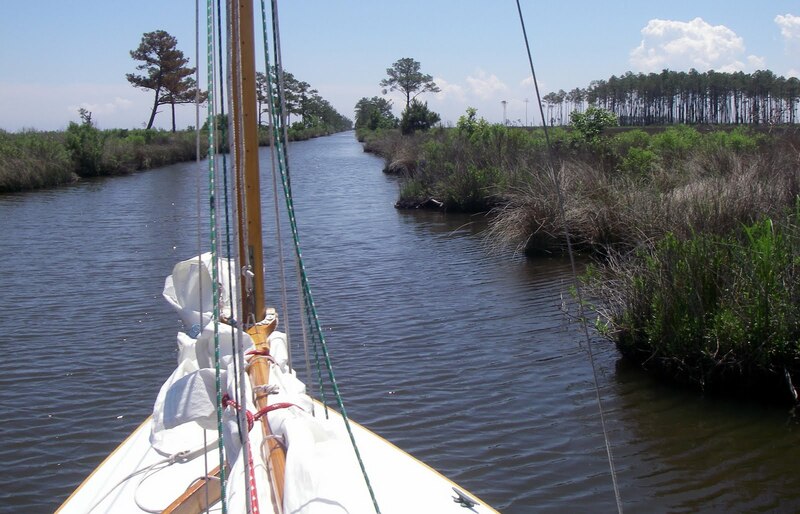 And below is Old Canal south of Cedar Island, one of two canals we'll take to get from the Neuse River to Core Sound. This looks like it is two or three times wider than Dump Creek and should be easy to negotiate. 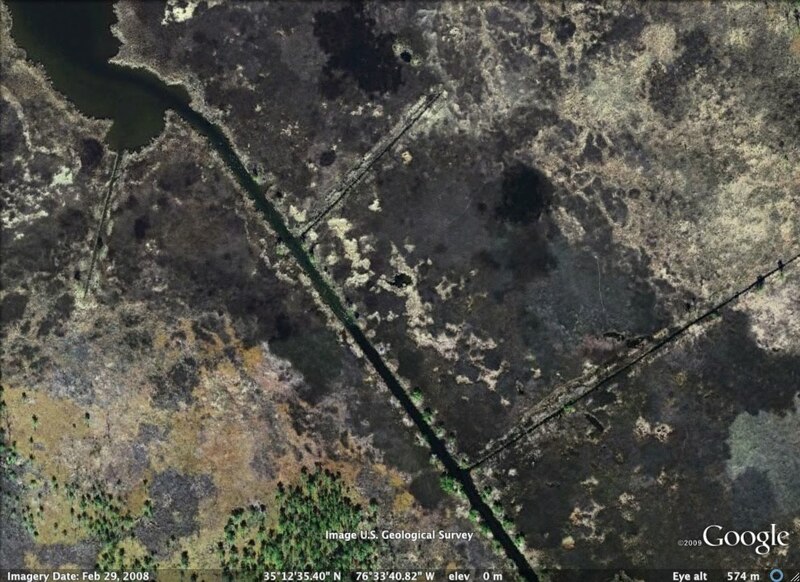 I know these ditches don't look very attractive from the sat photos, but at water level they are very interesting with different sorts of wildlife, plants, etc. On the last trip I saw a couple of snakes. We saw otter on the skeeterbeater and I've talked with people who have seen black bears. It will just add to the adventure. 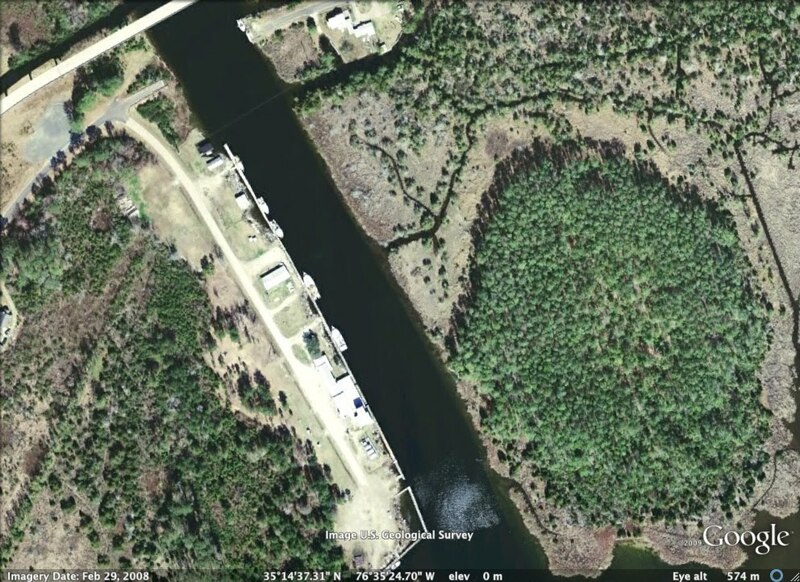 Thorofare Canal, the second canal behind Cedar Island (and the one that opens on to Core Sound) looks very good. 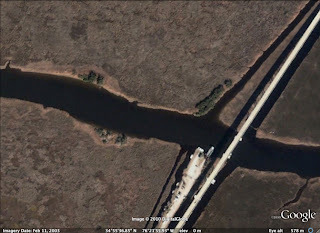 Bruce and I saw this canal when driving from Harkers Island to the Cedar Island Ferry after our '07 trip. 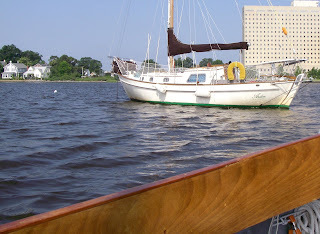 I remember at the time we both thought it would be fun go through the canal, either under sail or under power, and be surrounded by miles of marsh land. And here is an evening photo from the last trip (just because I like the glow of the setting sun). 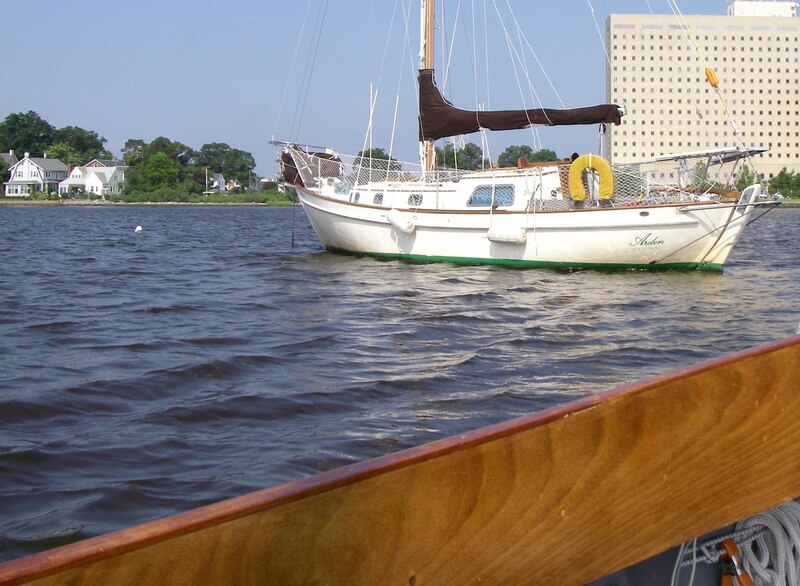 Nice, sunny and windy today for a sail down the Elizabeth River to the James River and back. Cruised through Crawford Bay first thing and found Arden, an Aries 32 (I think) still anchored there. I talked to the owner on a sail a couple of weeks ago. 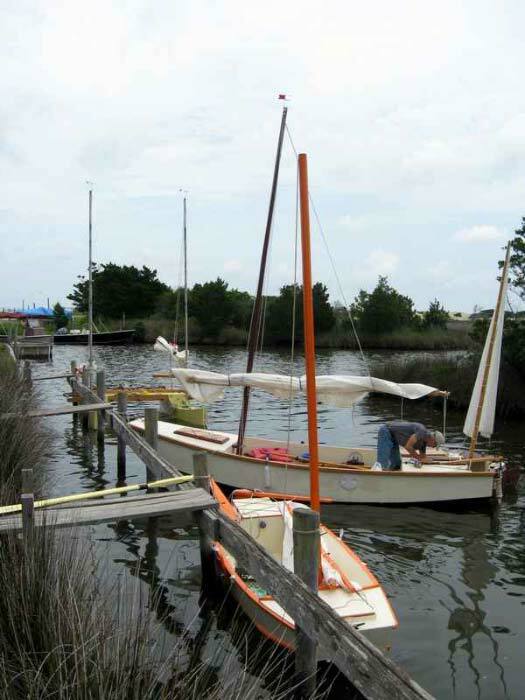 He has some work to do on her and then plans to sail south in the fall. Bahamas anyone? It was breezy enough, wind out of the southwest in our typical summer pattern, that I tied in a reef as I rigged the boat. I thought the wind would die down eventually but it never did. I kept the reef in there the entire time. There you can see the reef point outhaul tied in at the end of the boom. In the background is a collier being nudged up against the coal pier. Lots of commercial traffic on the river today. Even with that reef I was heeled over for most of the day. Very fun and comfortable. Still taking care of odds and ends. 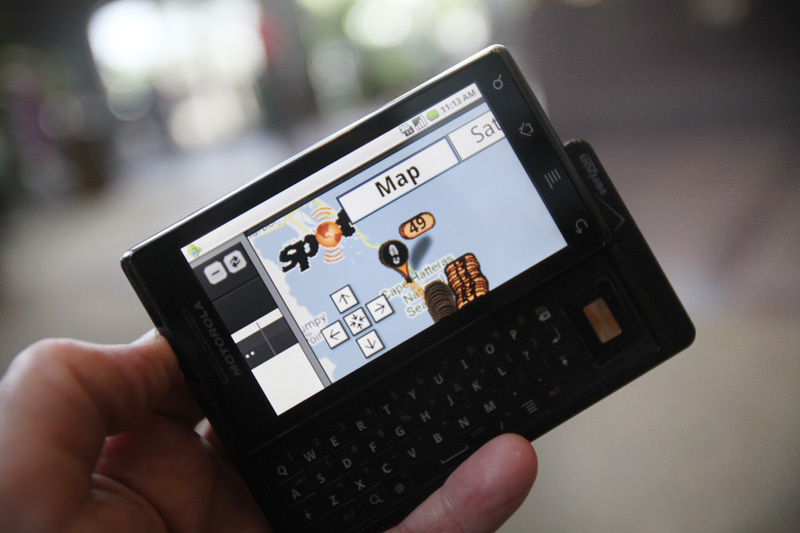 Finished creating my waypoints and importing them on to my old Legend Etrex gps. You can see from the screen shot below that the mapping technology from just a few years ago was (and on my gps, still is) very crude. I was having some computer issues and ended up marking the waypoints in google earth then copy and pasting to my gps's MapSource software. Now that I look I see I misspelled the names of some locations. But it will get me where I need to go. And once imported on Bruce's much newer gps we'll be able to see the waypoints on the nice Blue Water charts (or whatever it is called). It should work out just fine. I've started getting "ok" SPOT messages from Bruce. He is off on a trip somewhere in the southwest. Looks like he is trying to balance out his life. To counter act his week aboard Spartina he is spending a week in what looks to be desert. The SPOT message map below shows him somewhere north of Las Vegas. He'll get back home just a couple of days before hopping on a plane to come back to the east coast for our trip. That is better than last fall when he flew in directly from a three week African safari for the Crab House 150. The days seem to be flying by. I thought I had everything ready to go but now I find myself counting breakfast bars, cups of fruit (mandarin oranges, tropical fruit and mixed fruit with cherries are the favorites), instant mashed potatoes and boil-in-the-bag rice. 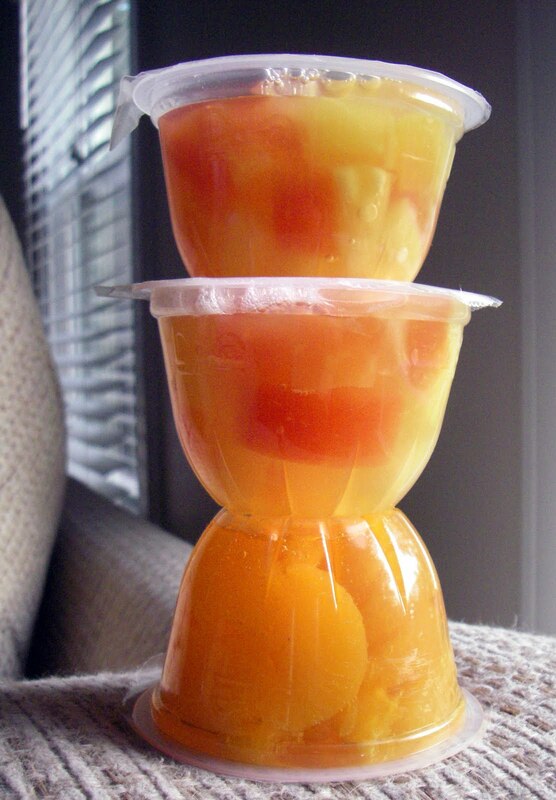 The cups of fruit I consider to be a luxury. They are heavy and take up space (out of six gallon jars of food they will fill two of them). But we have them with every meal. Breakfast is a breakfast bar and cup of fruit. Lunch is tuna salad, crackers and a cup of fruit. Dinner includes whatever Bruce wants to cook on the coleman stove and a cup of fruit for dessert. On long hot days that cool, sugary syrup tastes really good. And of course I'm looking over the charts still. 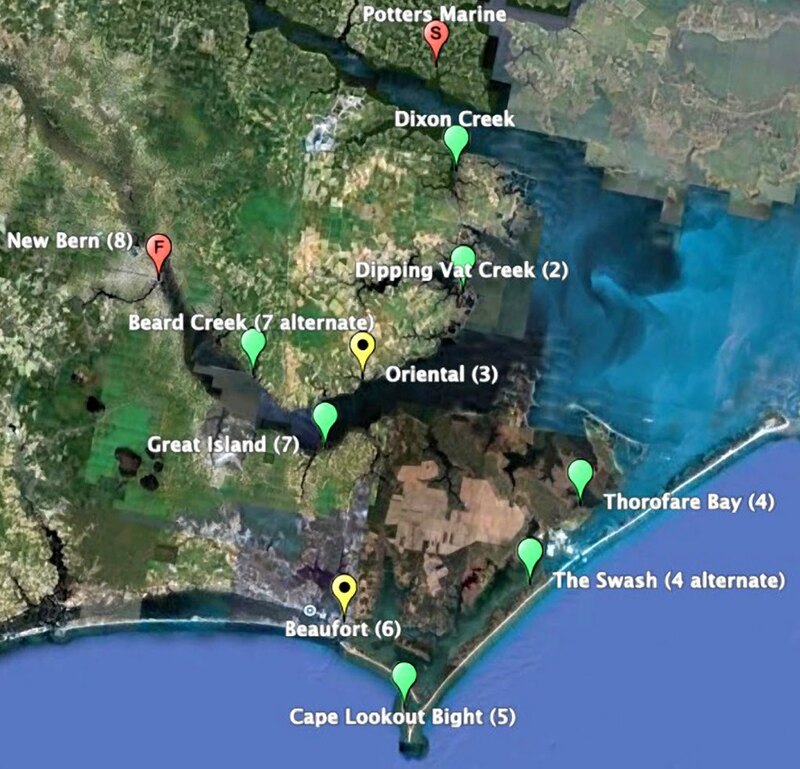 On day one we'll sail from Potters Marine to a creek of the ICW. On the way we'll pass by Indian Island on the Pamlico River. That day's sail is just ten miles. 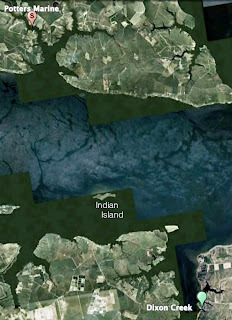 If we are making good time we might stop to visit Indian Island. On day four we head east fom Oriental to Core Sound by way of some canals behind Cedar Island. My plan was to anchor in Thorofare Bay. But now that I look at it I would like to make it further towards the south and reach The Swash. 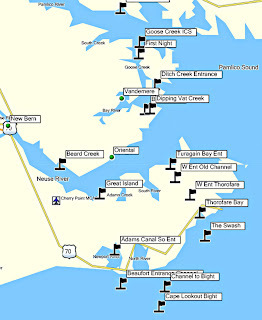 That would give us a shorter trip the following day to Cape Lookout Bight, more time to explore the beaches and dunes out on the Bight. It would be an extra eight or ten miles of traveling that day, but if weather is good we should be able to make it. 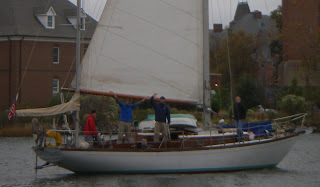 Bruce and I are doing a little something different on the sail in June. We'll have some company! We'll be joined, for at least part of the trip, by the crew of Dawn Patrol. That is them below, Paul, aka Dances with SandyBottom, and Dawn, SandyBottom Kayaker. 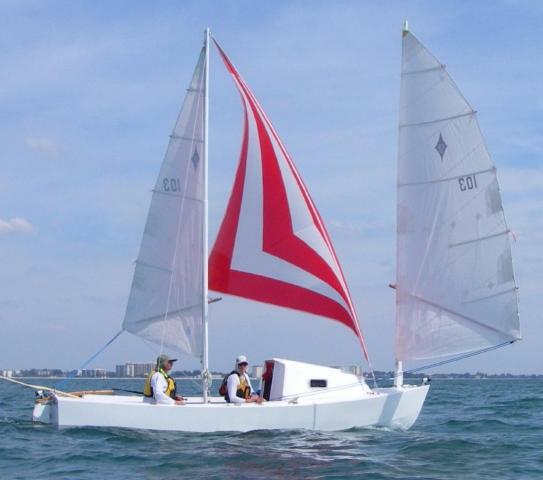 What does "sailing together" mean? We are not really sure. We started talking about this trip last November when I met Paul and Dawn in nearby Hampton (more on that below). They had been looking at this blog for a while and I had been following Dawn's blog for a couple of years. We had some interests in common and we all love coastal North Carolina. We decided to share a trip and see what happens. Paul's suggestion was that Bruce and I plan our trip as if we were on our own. The Dawn Patrol crew would watch the plan develop and then join in for part or maybe all of the trip. 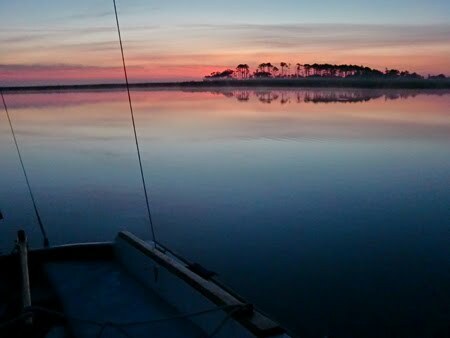 We'll start together, spend the first night in the same anchorage (Spartina has already invited Dawn Patrol over for dinner on the first night out), and then we'll see what happens from there. 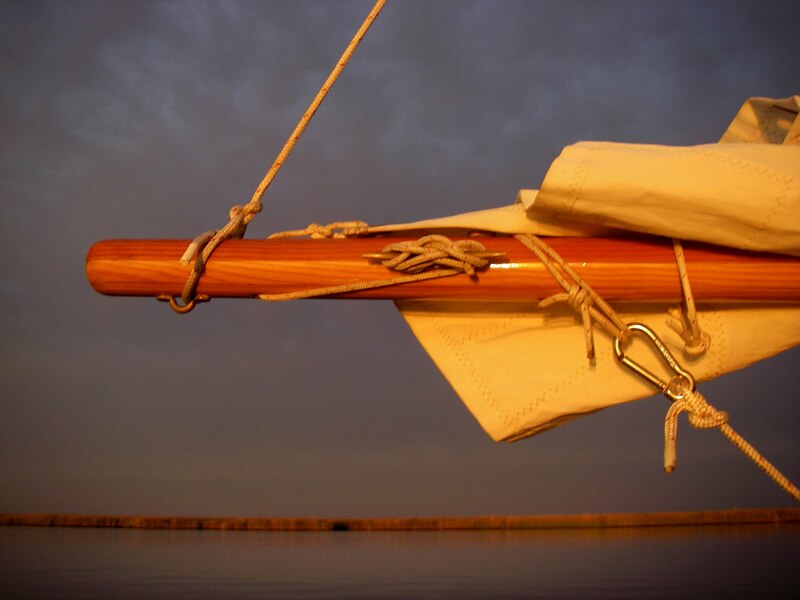 I expect we may sail within sight of each other a couple of days, anchor nearby a couple of nights, branch off from each other at times and maybe reconnect at towns - Oriental or Beaufort - along the way. Our boats have slightly different capabilities. Dawn Patrol is a Graham Byrnes designed Core Sound 20. I've heard the design is very fast and she may well out pace us (especially if she is flying that third sail - a fisherman? ?- that you see in the photo below). I really don't know what to expect in that area. Another difference is that Spartina has a 3.5 hp outboard engine, Dawn Patrol's backup power is a couple of long sweeps - Paul prefers to row. 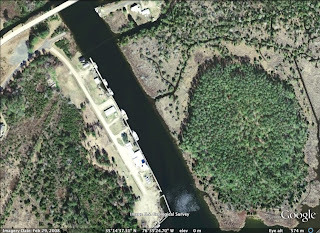 It may be on day four that our paths diverge and Bruce and I head east from Oriental and transit a couple of canals behind Cedar Island on our way to Core Sound. 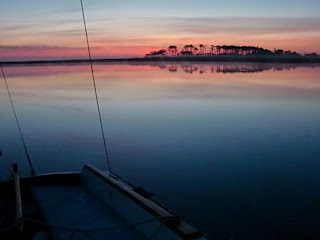 The canals, particularly with wind on the nose, might be tough for Dawn Patrol and they may choose to head elsewhere. If so, I do hope we reconnect at another point on the trip. We are starting this trip with no expectations for the other boat. We'll just see what happens and, I'm sure, have a good time. I had been exchanging emails with both Paul and Dawn for a while when I finally got to meet them in person last November. They had come up to nearby Hampton to say goodbye to their son Alan as he set off on Eye of the World sailing circumnavigation. What an adventurous family. 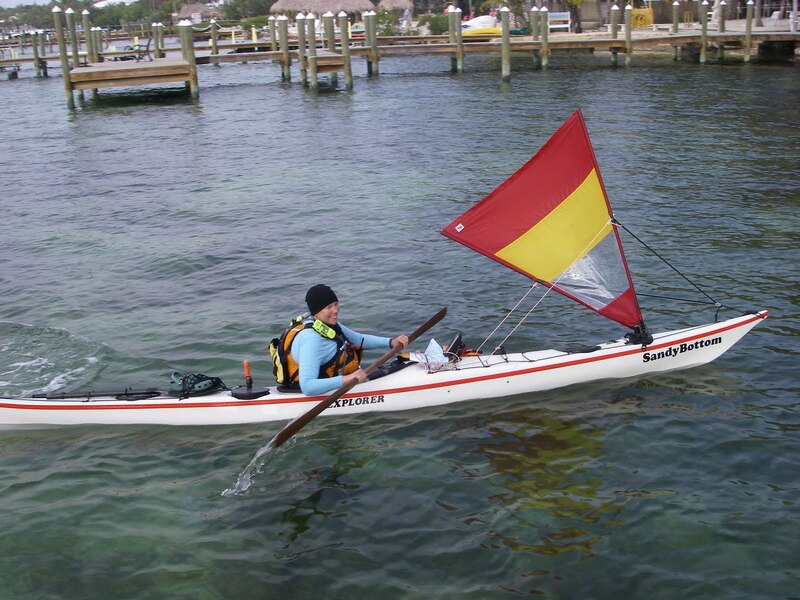 Dawn had done several Everglades Challenge Races, a Florida Ultimate Challenge, a month long expedition in Newfoundland and several other races or expeditions. Just since I met her in November she has paddled the Georgia Coast, done an EC Challenge, explored the western shore of Pamlico Sound (some of the same territory I sailed on the walkabout) and kayaked from Ocracoke to Roanoke Island. 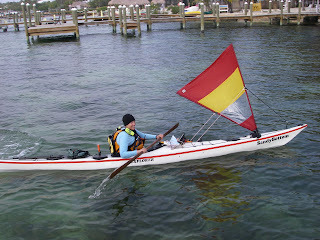 On the web I also watched Paul and his son Alan build Dawn Patrol and then race it on an Everglades Challenge. And now Alan is off on a round the world sailing trip. These folks will have some stories to tell. I'll look forward to hearing some of them on our June trip. 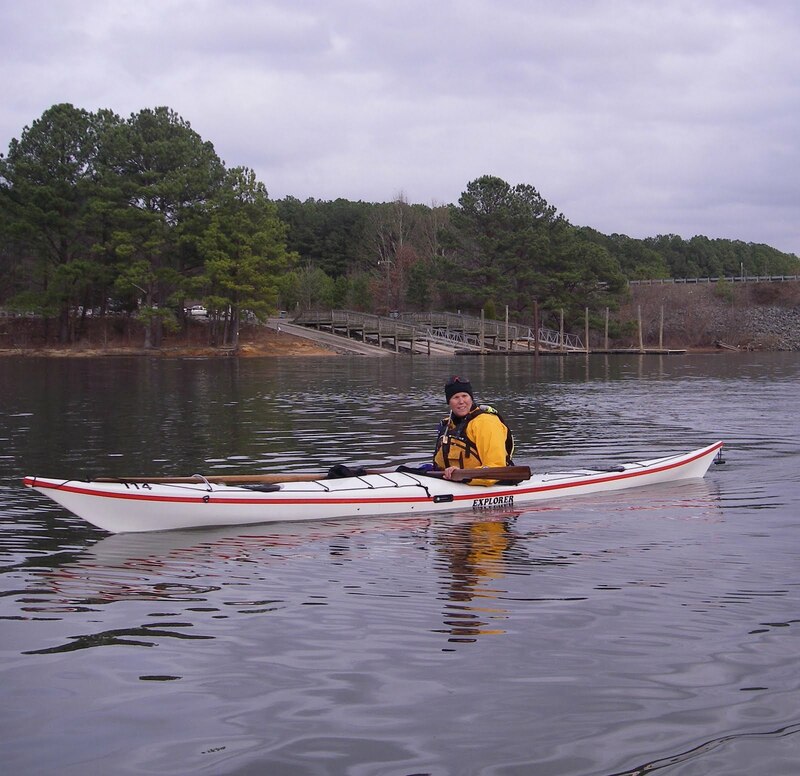 Dawn, below, is most comfortable in a kayak but she has been training for a while now on a sailboat. 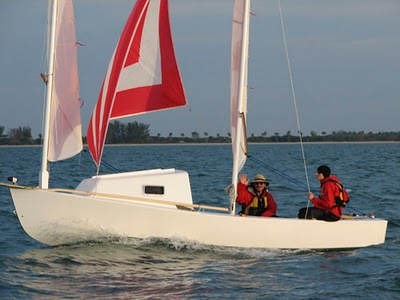 It will be interesting to see how she adapts her on the water skills and experience to traveling under sail. A lot of her journeys have been races. I hope she enjoys the more relaxed pace of a cruise. Bruce and I are very excited about sharing at least part of the journey with them. It will be a great chance to learn, compare boats, share our experiences. I expect we'll sail together at times, sail apart at other times times. We'll keep in touch by vhf radio and cell phones, and also use our smart phones (when we get a good signal) to watch each other's SPOT track. Every cruise that Bruce and I have made has been different. And they have all been a lot of fun. Making this trip with Paul and Dawn will add a new wrinkle to the adventure. I can't wait to see how it works out. On another note, I'm sure you heard that Art Linkletter passed away yesterday. My wife got to spend some time with Mr. Linkletter when he came through town a few years ago. He told her a story about the time he visited a nursing home. 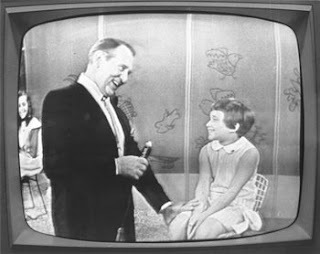 Most of the residents had probably been parents of young children in the 60's and watched him on black and white tv's in their living rooms. He sat down next to a woman at the nursing home. "Do you know who I am? he asked her. She paused, looked at him and said "No, but if you ask the lady at the nurse's station she can probably tell you." I was sorry to see his obituary in the paper, but at the same time I remembered the story and had to smile. No, this isn't the National Enquirer, it's just an update on some recent sailing. The shocking photos are from Steve who goes by the screen name Shock. 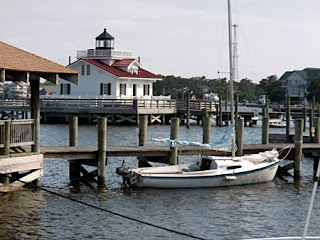 He and his buddy took his boat, a 19' Mariner (above), down to the Roanoke Island area of North Carolina. 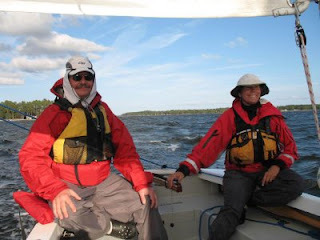 They did 140 miles of sailing over five days and it looks like they had great weather. Good for them. The weather has certainly changed down there with a low pressure system hanging off the coast causing a mini-nor'easter. They guys on the OBX130 have been battling it out with the wind. 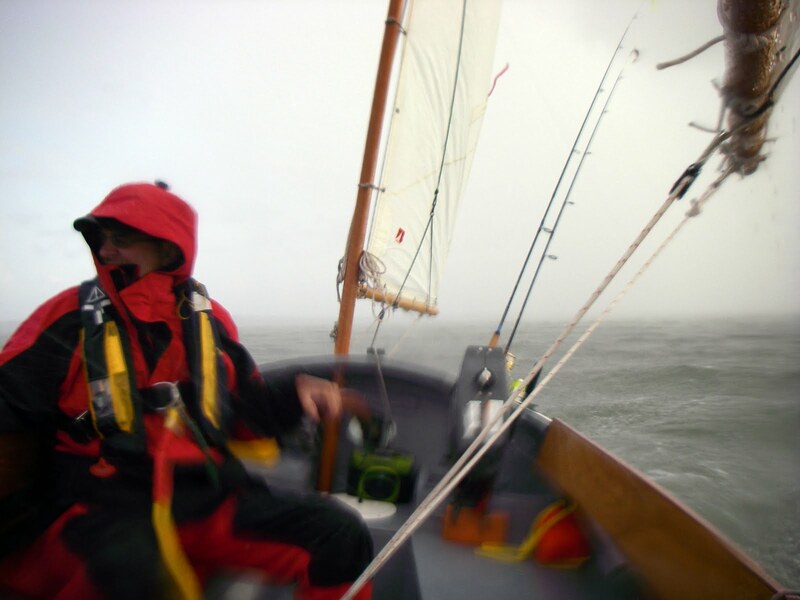 Gusts of 30 mph and big waves, you can read about it here on their update page. Below you'll see Dave (I think) at right thanking some of the other sailors after his boat capsized off of Harkers Island. Glad you are ok Dave, sounds like a wild ride. I've been getting ready for our June cruise in the evenings, putting together lists, updating the SPOT, checking batteries and all that other fun stuff. Can't wait to go. Spartina stayed in the garage today with a forecast of rain and severe thunderstorms. Good choice for once, the thunder started a little after 11 a.m., heavy rain and then lightning soon followed. It was a day to get chores around the house, maybe get ahead of the curve and hope for good weather next weekend. While I'm staying dry there are a couple of good trips worth following, one going on right now and one starting, I think, tomorrow. SandyBottom Kayaker is in a group of kayakers paddling from Ocracoke Island, one of my favorite places, to Manteo, another favorite place, on Roanoke Island. 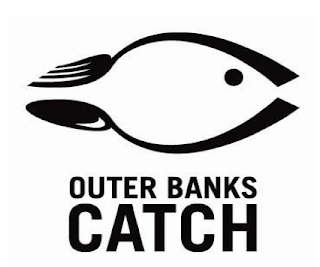 They will be paddling on Pamlico Sound just inside of the Outer Banks. She published her tracking page on her blog so I don't think she'll mind if I post it here. And it looks like her husband Paul, aka Dances with SandyBottom, is updating her blog as she goes. It will be worth tuning in there. That is a photo of Dawn below from an EC trip. Today, on their first full day of paddling they crossed Hatteras Inlet, the opening between Ocracoke Island at left to Hatteras Island at the right. The currents in there can be treacherous but I'm sure this experienced group of kayakers timed it just right, it looks from the SPOT track that they made it through just fine. It is a beautiful area with blue green water, tiny islands with white sand and several shoals. 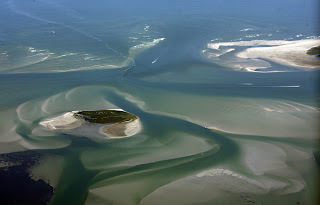 Below is a photograph I shot of the inlet last summer on the way down to Ocracoke in a small plane. The northern tip of Ocracoke is at the right in this photo. You can see how the currents have carved out the shoals. I wonder what it looks like from water level (a kayak). I have crossed the inlet dozens of times over the years on the ferry, Bruce and came back across the inlet on the ferry in 2007 on the way home from the SkeeterBeater. That was beautiful evening. We've published those photos before, you can see them here. 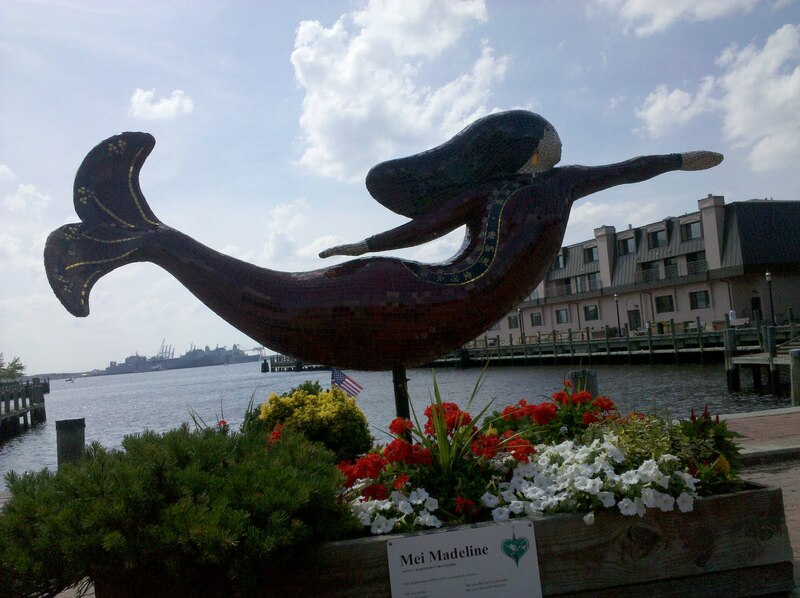 I think the paddle to Manteo will go through Friday. I'll look forward to see the photos and reports. 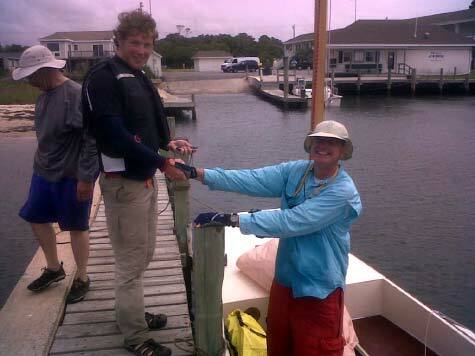 Just about 20 miles southwest of Ocracoke the captains of the OBX130 are meeting sometime today. The sail, down Core Sound to Cape Lookout Bight, Shackleford Banks and back up Core Sound, starts tomorrow. One of the particpants in Chuck of Duckworks Magazine. He is sailing with Bill Moffitt, one of the organizers, aboard Bill's Mikesboat. Below is a photo from the exploratory trip they did last summer while planning this year's event. Again, I can't wait to read there stories. It looks like Chuck will be reporting in during the trip here. So I'm not on the water, but it is good to see that some other folks are out there. Hopefully I'll get out for a few more day sails in the next couple of weeks. The the June cruise is less than four weeks away. 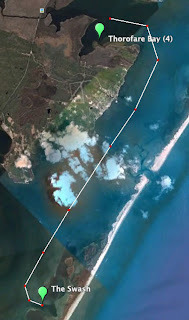 Before morning the wind shifted, and by nine o'clock I retraced my steps to the cape, and on Tuesday rowed down to Hatteras Inlet, which was reached a little past noon. Before attempting to cross this dangerous tidal gate-way of the ocean I hugged the shore close to its edge, and paused to make myself familiar with the sand-hills of the opposite side, a mile away, which were to serve as the guiding-beacons in the passage. How often had I, lying awake at night, thought of and dreaded the crossing of this ill-omened inlet! It had given me much mental suffering. Now it was before me. Here on my right was the great sound, on my left the narrow beach island, and out through the portal of the open inlet surged and moaned under a leaden sky that old ocean which now seemed to frown at me, and to say: "Wait, my boy, until the inlet's waves deliver you to me, and I will put you among my other victims for your temerity." As I gazed across the current I remarked that it did not seem very rough, though a strong ebb was running out to the sea, and if crossed immediately, before the wind arose, there could be no unreasonable risk. My canvas deck-cover was carefully pulled close about my waist, and a rigid inspection of oars and row-locks was made; then, with a desire to reserve my strength for any great demand that might be made upon it a little later, I rowed with a steady stroke out into Hatteras Inlet. There was no help nearer than Styron's, two miles away on the upper shore, while the beach I was approaching on the other side was uninhabited for nearly sixteen miles, to the village at its southern end, near Ocracoke Inlet. Upon entering the swash I thought of the sharks which the Hatteras fishermen had told me frequently seized their oars, snapping the thin blades in pieces, assuring me, at the same time, that mine would prove very attractive, being so white and glimmering in the water, and offering the same glittering fascination as a silver-spoon bait does to a blue-fish. These cheerful suggestions caused a peculiar creeping sensation to come over me, but I tried to quiet myself with the belief that the sharks had followed the blue-fish into deeper water, to escape cold weather. The canoe crossed the upper ebb, and entered an area where the ebb from the opposite side of the inlet struck the first one. While crossing the union of the two currents, a wind came in at the opening through the beach, and though not a strong one, it created a great agitation of the water. The dangerous experience at Watchapreague Inlet had taught me that when in such a sea one must pull with all his strength, and that the increased momentum would give greater buoyancy to the shell; for while under this treatment she bounced from one irregular wave to another with a climbing action which greatly relieved my anxiety. The danger seemed to be decreasing, and I stole a furtive glance over my shoulder at the low dunes of the beach shore which I was approaching, to see how far into the inlet the tide had dragged me. The white water to leeward warned me of a shoal, and forced me to pull hard for the sound to escape being drawn into the breakers. 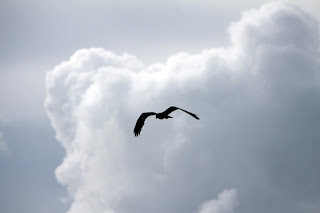 This danger was hardly passed, when suddenly the waters around me seethed and foamed, and the short waves parted and closed, as great creatures rose from the deep into the air several feet, and then fell heavily into the sea. My tiny shell rocked and pitched about wildly as these animals appeared and disappeared, leaping from the waves all around me, diving under the boat and reappearing on the opposite side. They lashed the current with their strong tails, and snorted or blowed most dismally. For an instant surprise and alarm took such possession of me that not a muscle of my arms obeyed my will, and the canoe commenced to drift in the driving stream towards the open sea. This confusion was only momentary, for as soon as I discovered that my companions were porpoises and only old acquaintances, I determined to avoid them as soon as possible. With a quick glance at my stern range, a sand-hill on the shore of the inlet, and another look over my shoulder for the sand dunes of the other side, I exerted every muscle to reach the beach; but my frisky friends were in no mood to leave me, but continued their fun with increased energy as reinforcements came up from all directions. The faster I rowed the more they multiplied, ploughing the sea in erratic courses. They were from five to seven feet in length, and must have weighed from two hundred to four hundred pounds each. Though their attentions were kindly meant, their brusqueness on such an unsteady footing was unpardonable. I most feared the strong, shooting movements of their tails in the sudden dives under my canoe, for one sportive touch of such a _caudality_ would have rolled me over, and furnished material for a tale the very anticipation of which was unpleasant. [Illustration: CROSSING HATTERAS INLET.] The aquatic gambols of the porpoises lasted but a few minutes after they had called in all their neighbors, and had chased me into three feet depth of water. They then spouted a nasal farewell, which sounded more catarrhal than guitaral, and left me for the more profitable occupation of fishing in the tideway of the inlet, while I rowed into a shallow cove, out of the ebb, to rest, and to recover from the effects of my fright. As I pulled along the beach the tide receded so rapidly that the canoe was constantly grounding, and wading became necessary, for I could not get within several feet of the shore. When five miles from Hatteras Inlet I espied an empty grass cabin, which the fishermen used in February while catching shad; and, as a southerly wind was now blowing from the sea, and rain was falling, it offered a night's shelter for the traveller. This Robinson Crusoe looking structure was located upon the low land near the sound, while bleak, sharp-pointed, treeless and grassless sand-hills, blown into shape by the winds, arose in the background, and cut off a view of the ocean, which, judging from the low, melancholy moaning coming over the dunes, was in a sad mood. The canoe was hauled into the bushes and tied securely for fear a deceptive tide might bear it away. The provisions, blankets, &c., were moved into the grass hut, which needed repairing. The holes in the south wall were soon thatched, and a bed easily prepared from the rushes of the marsh. It mattered not that they were wet, for a piece of painted canvas was spread over them, and the inviting couch finished. 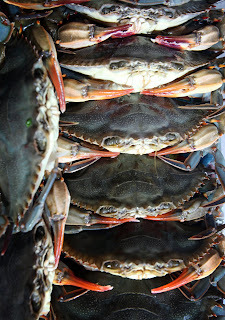 Mid-May on Chesapeake Bay means soft shell blue crabs, one of my favorite times of the year. I headed out to my local seafood wholesaler this morning to get a dozen soft shells for the annual family dinner - it is kind of like a holiday for us. Sad to say when I got to the marina the shop was closed up, the shedding tanks were dry and stacked off to the side. Normally the tanks would be full of water pumped out of the nearby river, filled with "peeler" crabs about to shed their hard shells. Workers would watch the tanks around the clock, pulling out the crabs as soon as they shed their shells, putting the soft shell crabs on ice. I've bought my soft shells at this place, located next to a seafood restaurant on a little basin off the Lynnhaven River, for years. For $25 you could pick your dozen crabs right out the shedding tanks. I don't remember any cash register, receipts or sales tax. Cash and carry. That was a pretty good deal, $25 for a dozen when they were selling at the local market for $7 each. But for whatever reason they were not running a shedding operation this year. 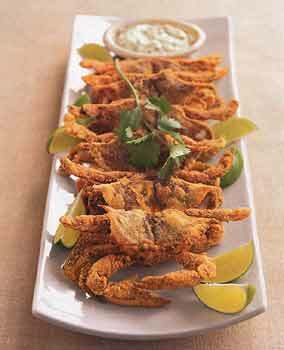 I'll cook up our crabs tomorrow with a recipe I found a few years ago in Bon Appetit for Corn Meal Crusted Soft Shells (above). My presentation certainly won't be as nice, but I think they'll taste pretty good. We'll serve it with rice, a black bean/roasted corn salsa and a nice chardonnay. I think we'll do ok. Speaking of local seafood, here is the new logo for the seafood marketing group in the Outer Banks. Pretty nice. They are pushing locally caught seafood, supporting your local fishermen. I'll buy local any chance I can. Here is a story about the campaign on The Island Free Press, the very nice online newspaper for Hatteras Island. 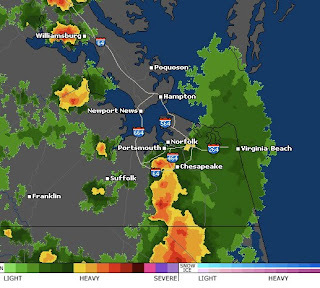 I don't know about sailing tomorrow, forecast right now is for 70% chance of thunderstorms. I'll just have to wait and see what it is like when I get up in the morning. Brian's comment about yesterday's post - "Thunderstorm must have been hairy" - caught my attention. 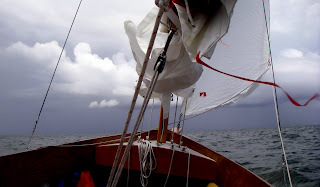 That squall really wasn't any problem but it did get me thinking about the storm's we've sailed through over the last couple of years. In fact I thought about it all day. Decided to go through the cruise photos and find the images from thunderstorms. Here they are. We've used some before on the blog, hope you don't mind me showing them again. We'll get some fresh photos in just a few weeks. 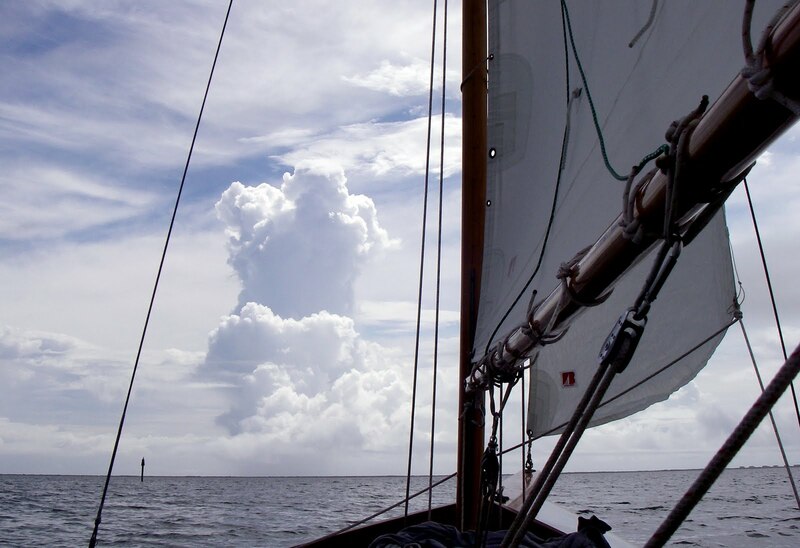 Above is from a solo sail on Pamlico Sound in the spring of '08. I had been anchored near Great Island the night before. 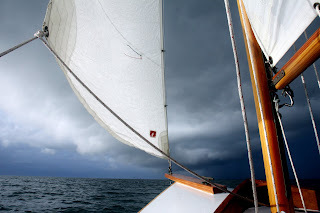 As I sailed NE towards Wysocking Bay the next morning a storm came from the north. I was by myself and didn't quite know what to do. I sailed back near the island, dropped the main and the jib and waited out the storm. 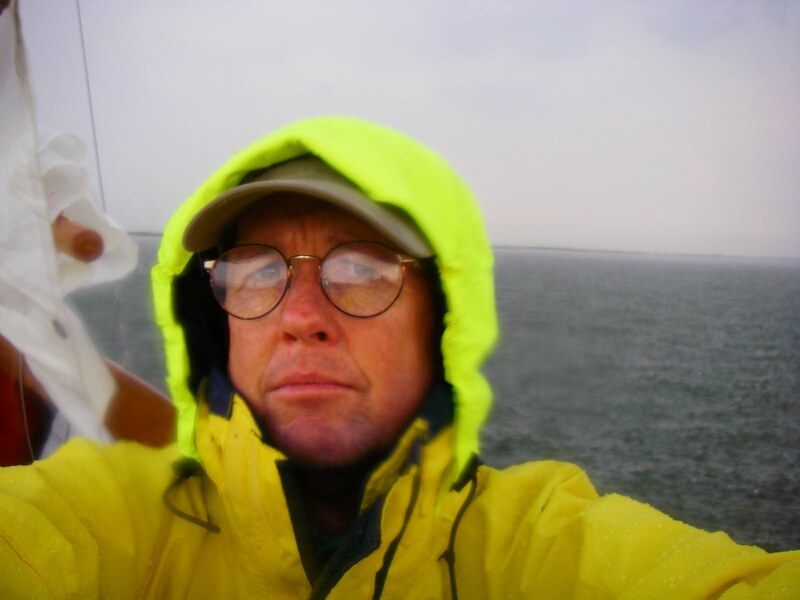 I like my foul weather gear. Thanks Mom! This photo above is from Core Sound on the trip with Bruce in 07 after we sailed through the isolated thunderstorm shown in yesterday's post. It is a thunderstorm erupting off of the Core Banks. Pretty cool looking. And I'm not sure where this photo above is from, I've got several like it. The typical summer rain in the south. Above is the worst weather I've ridden out in a boat. 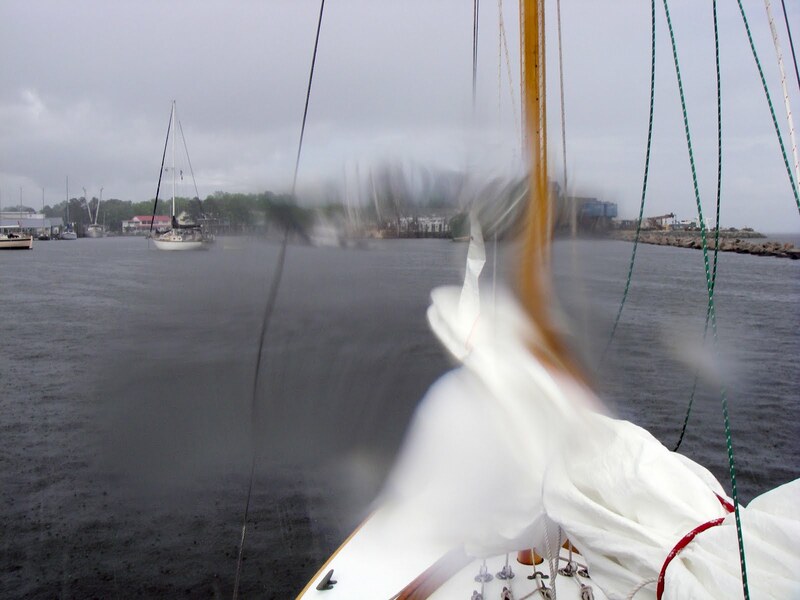 Fortunately I was anchored at the time, don't know what I would have done if I had been sailing (well, yes I do know. I would have dropped the main and the jib and ridden it out under mizzen only and it would have been the longest evening of my life). 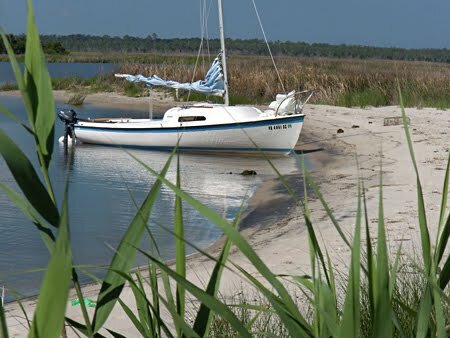 I was in Cedar Creek on a solo sail. Weather radio went crazy with that "warning" sound. 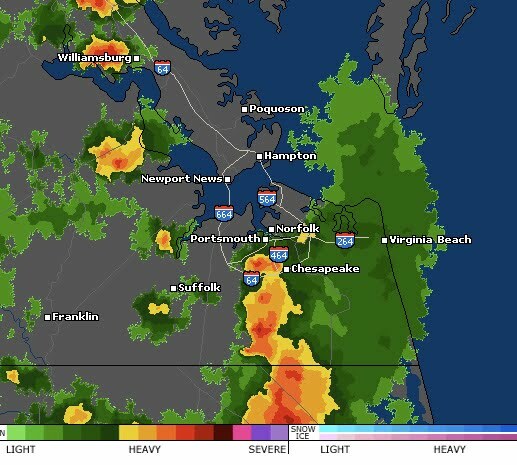 High winds, funnel clouds on the mainland. 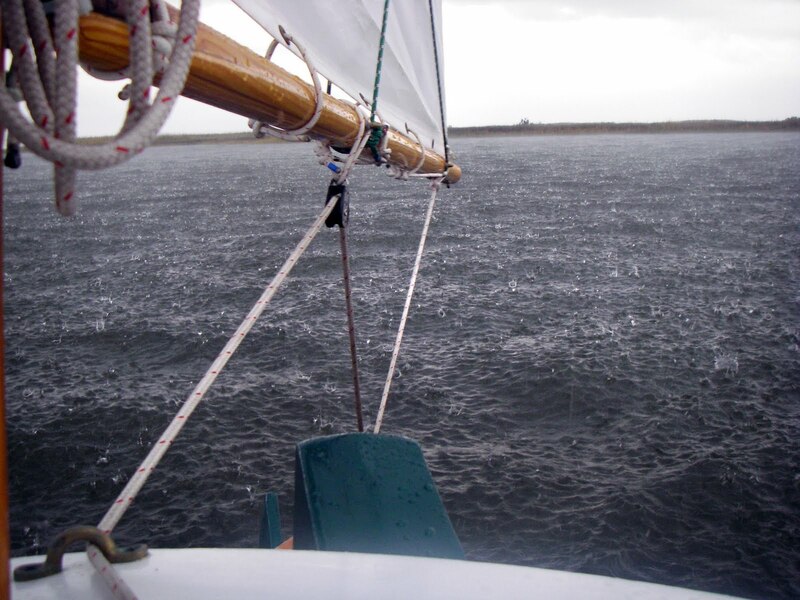 I moved the center of the creek, kept the mizzen up, raised cb and rudder and rode it out just fine. And above is heading out of Wysocking Bay on Day 2 of the SkeeterBeater. 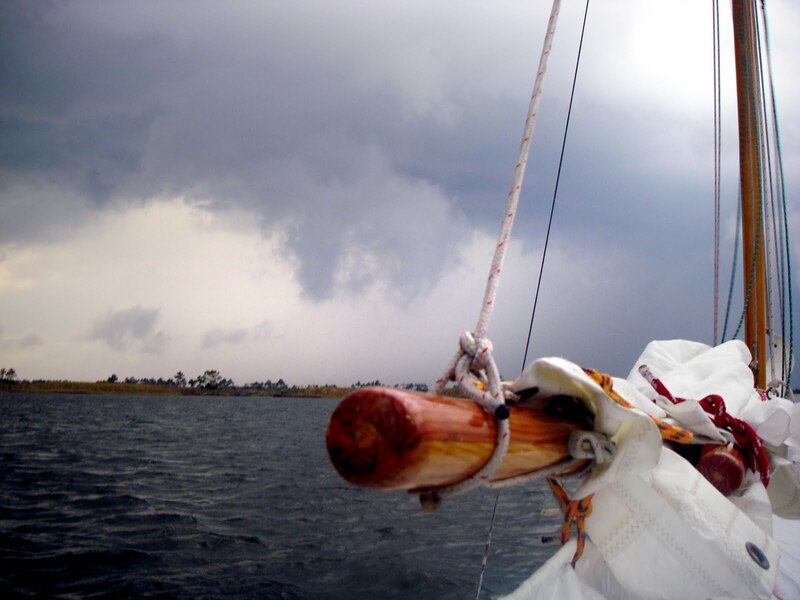 A fast moving squall out of the north with Bruce, below, at the tiller. 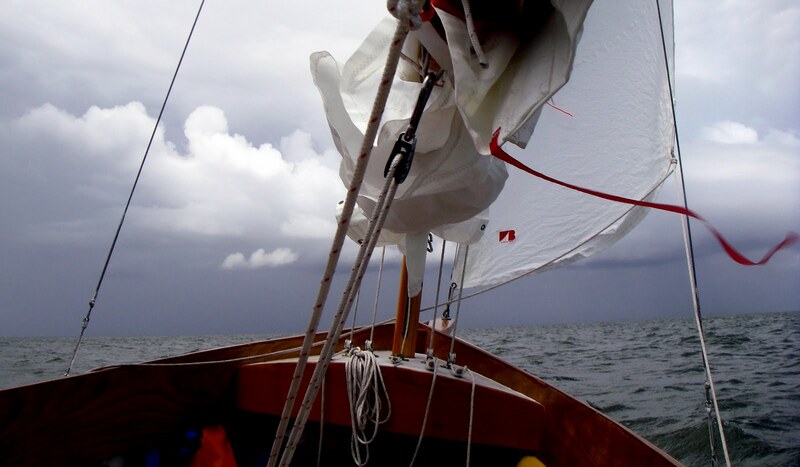 And later that day we sailed near four other thunderstorms in the Swan Quarter/Rose Bay area. Dodged all the rain but felt the wind. It was a fun, exciting afternoon sailing under mizzen and jib at times. It was, we found out 30 minutes later, a thunderstorm. And there we are heeled over in that thunderstorm. Kept full sails up throughout the storm, Bruce at the tiller and me sponging out the cockpit. 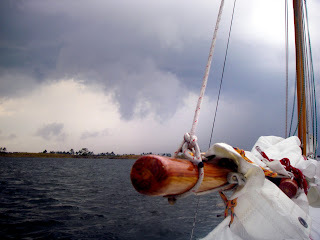 And below is coming out of the ICW at Gale Creek on to the Bay River, heeled over in a storm approaching from the north. That was probably the biggest, darkest storm we've seen on our cruises. By then we didn't see storm as a problem, just an opportunity for more wind. 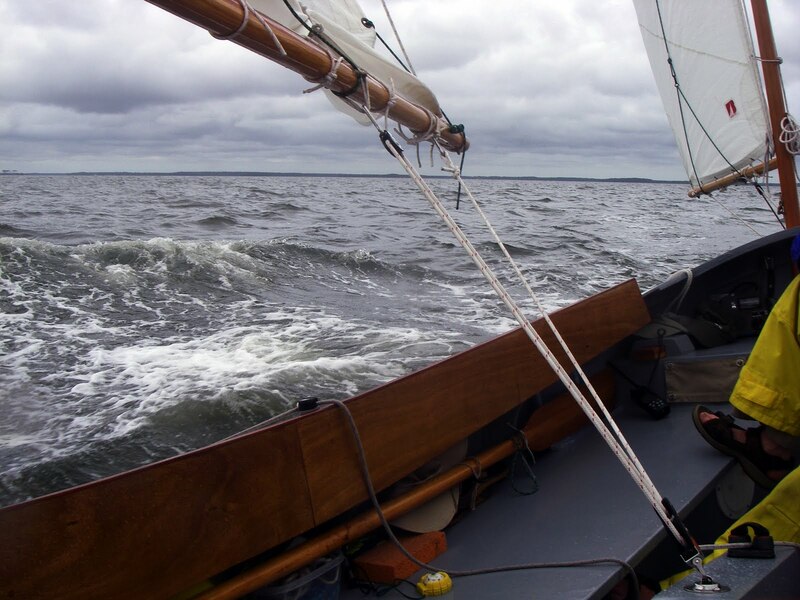 We rounded up, tucked a reef in the main and kept on sailing. 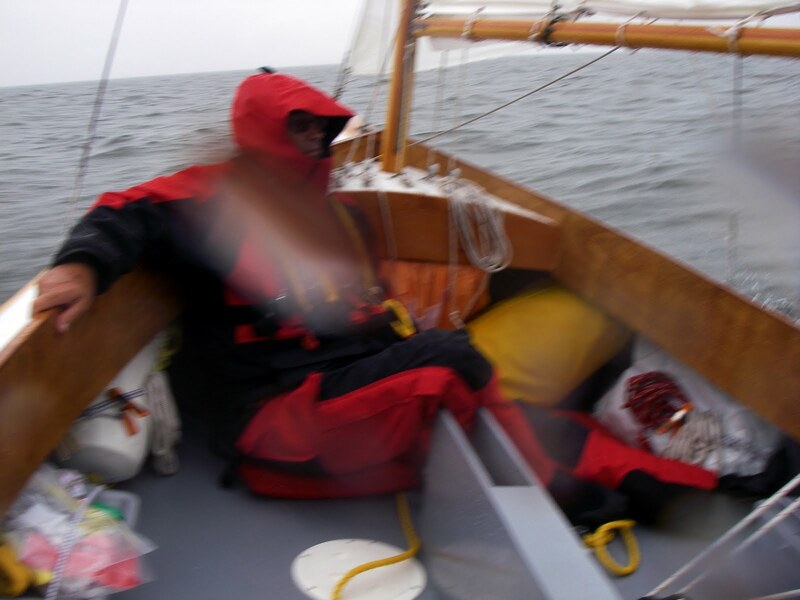 The key is good foul weather gear. Bruce has a nice set from Cabela's, mine is from West Marine. They make all the difference in the world. And later that same day coming into Oriental in, of course, the rain. It was just a light shower with no wind. Most of the storms - I guess you could call them squalls or isolated thunderstorms - lasted less than 30 minutes. Some good wind, a little excitement and a change of pace from the typical day of sailing on the sound. 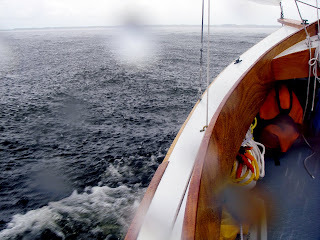 Don't let this post give you the impression that our trips are rain soaked. Typically they are sunny and hot. Sometimes it is nice to have a little thunderstorm to cool things off.